Mario Savio of the Free Speech Movement meets NSA whistleblower Edward Snowden in PLANET SNOWVIO; Who travels to the beat of a “Different Drum”? On the 50th anniversary of the historic Free Speech Movement, FSM (1964-2014), multi-media artist Jay Critchley produced a stage reading of his new experimental musical, PLANET SNOWVIO. The one-act play is based on the meeting of Mario Savio, FSM, and NSA whistleblower Edward Snowden. On their journey to PLANET SNOWVIO they encounter Russian President Vladimir Putin and US President Barack Obama. This political satire is sprinkled with humorous interpretations of classic pop songs. PLANET SNOWVIO debuted at the UC Berkeley Art Museum and Pacific Film Archive on April 27, 2014. Critchley was invited by artist Raphael Noz as part of The Something, an experiment in participatory music, performance and video at the museum. Musical director and arranger for PLANET SNOWVIO, Masis Parunyan, received his Bachelor’s degree in Music from the University of California, Berkeley. Following the civil rights’ Freedom Summer in Mississippi, the FSM helped propel the country out of the restrictive Cold War culture and sparked national and international campus activism and anti-Vietnam protests. “Recalling the significance of 1964, I read the biography of Mario Savio while closely following the dramatic revelations of whistleblower Edward Snowden. This inspired the creation of PLANET SNOWVIO - where these two historic, radical figures meet!” Critchley states. “Did Mark Twain have it right? ‘History doesn't repeat itself - but it rhymes.’ Where is the dissonance?” he added. 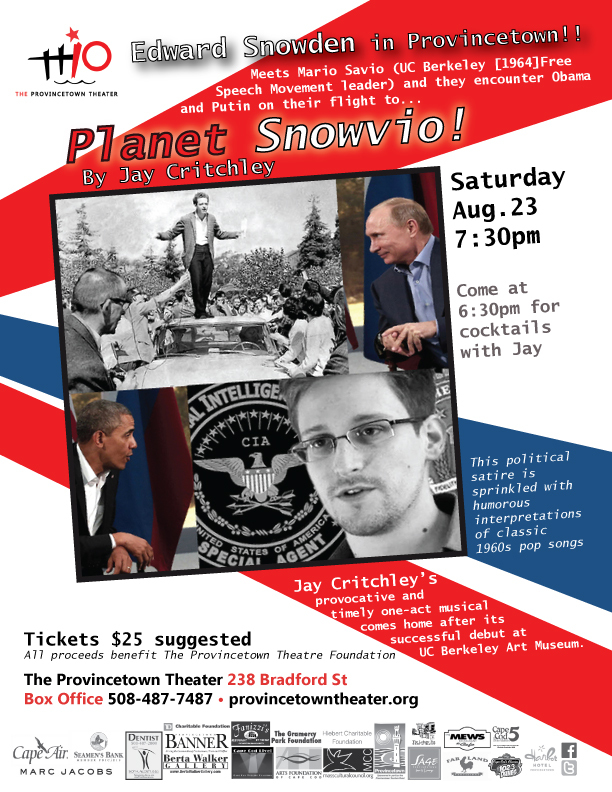 PLANET SNOWVIO mixes historic speeches with musical pop parody, including: Savio and Snowden singing, "I Got You Babe"; a Putin-Snowden duet, "YMCA" (Snowden: "Why NSA?" Putin: "Vi M Vi Fey?"). This mash up leads to "You Don't Own Me" by Leslie Gore. PLANET SNOWVIO includes a poignant reminder of the radical change that is happening with the seminal civil rights ballad, "A Change is Gonna Come" by Sam Cook. And finally, who travels to the beat of a "Different Drum"?